Considered a milestone in filmmaking history by scholars and documentarians, Snow White & The Seven Dwarfs has become one of the most viewed films of all time. Walt Disney virtually had to sell everything he had to complete the film, and many thought he had completely lost his mind, thinking no one would sit for one and a half hours to watch cartoons. Disney’s sophisticated use of film storyboarding, the ingenious multi-plane cinematography and the incredible personality achievement for each character has established this film as the quintessential animated motion picture by which most others are compared. 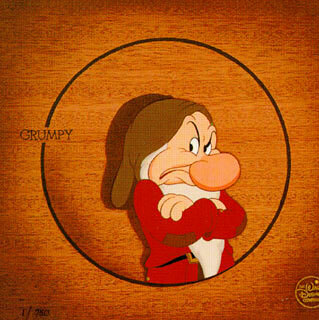 This fine art Hand Painted Limited Edition Cel features Grumpy in his most resistant mood. Recreating actual moments in the film, Disney artists paint each cel in the original paint colors used in the 1930’s. The Wood Veneer background recreates the presentation of animation art by Courvoisier Galleries in the 1930’s and 1940’s.